This Hall has the capacity for 50 persons for organising prayers, Keertan, Aarti of Shri Mata Vaishno Devi and other spiritual events. Bhaint singers of Shri Mata Vaishno Devi Shrine Board give their live performances in the Prayer Hall by singing devotional songs which further add to the spiritual bliss at this Complex. 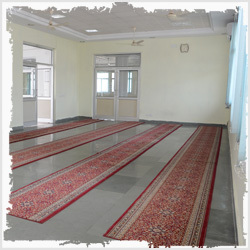 The Prayer Hall is ideal place for Bhajan Sandhya, Parvachans and other spiritual discourses.